I highly recommend the iMindMap software, it is truly excellent and really intuitive to use. As an official reseller of this amazing product I am happy to advise and guide you with your purchase. You can down load a trial version of the software which will enable you to experience the software first hand befeore you committ yourself. However I am convinced that you will want to purchase one of the three versions available! 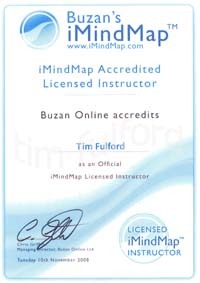 To download the trial version Buzan’s iMindMap™ simply click on the panel below and you will be able to try out this powerful brain friendly thinking tool free for 7 days or purchase it online. Alternatively if you would like to a boxed product then please contact me and I will arrange for a boxed product to be delivered to you promptly. As a reseller the software is also available as a boxed set which can be ordered via me. Simply email me tim.fulford@btinternet.com your details and your PayPal address and I will send you a PayPal Invoice. Within a few days your software will arrive and you will be able to start unlocking the full potential of your mind with this amazing software.